There are different ways to find the ID of a document tray. Using the link "List Organizations" and then "filecabinets", you get a list of all file cabinets and document trays. You can identify the document trays via the entry @isBasket = true. In this list you can find the ID of the basket. 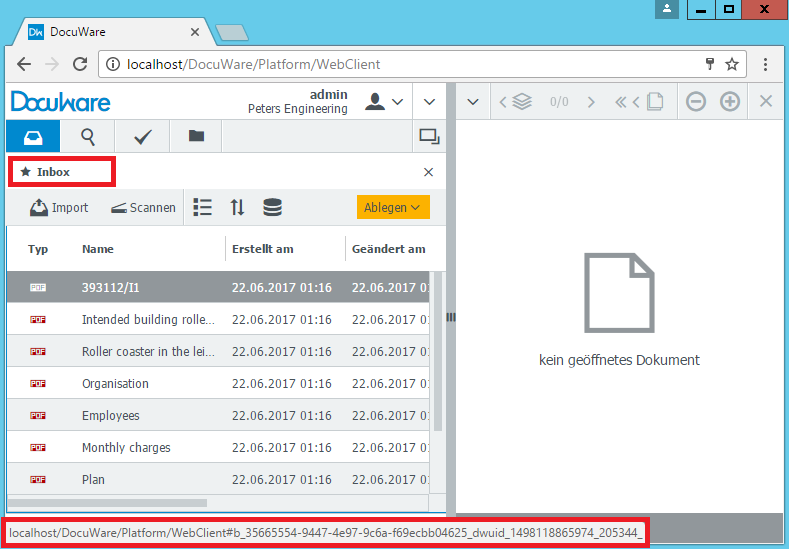 Open the database and navigate in the dwsystem to the table DWFileCabinet. Here you have to search for the row of the document tray. In the column "GUID", you can find the ID of the document tray. You have to format the GUID like this: b_[GUID], so the Platform can find this document tray. Open the document tray in the Web Client. Move the cursor over the title of the document tray. At the bottom of the browser, you can see the corresponding URL. Here you can gather the ID of the document tray. It starts after "#WebClient" and ends before "_dwuid". In the example in the screenshot it is "b_35665554-9447-4e97-9c6a-f69ecbb04625".